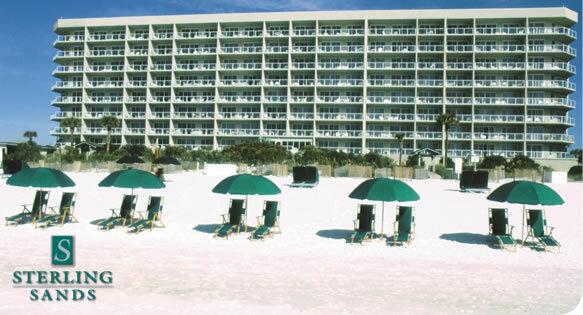 Sterling Sands resort is located directly on the Gulf of Mexico in the heart of Destin within walking distance of shopping, water parks and a variety of the area's best resturants. Sterling Sands offers 1-, 2-, and 3-bedroom condominiums (plus penthouse), each with a private balcony and panoramic view of the shimmering waters and sugar-white sand of the Emerald Coast. During your stay, enjoy taking a dip in the free-form pool (heated seasonally) or relax in the gulf-side hot tub. The lush strip of gulf-side lawn featuring a covered picnic and grilling area as well as a meeting space overlooking the gulf make Sterling Sands the perfect place for a family reunion, group gathering or beach wedding. Sterling Resorts guests enjoy free high speed internet access, unlimited DVD rentals and exclusive discounts at popular local attractions.